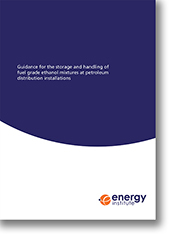 This guidance provides a technical overview and understanding of the issues associated with the storage and handling of fuel grade ethanol mixtures, the blending of ethanol mixtures into petrol and subsequent storage and handling of petrol/ethanol blends. This second edition extends the scope of the guidance to the use of ethanol/methanol blends and contains updated information on the latest industry legislation and research to ensure its continued applicability and relevance. For the purposes of this document, an 'ethanol mixture' is defined as including various combinations of ethanol and methanol along with denaturants such as petrol or a trade specific denaturant for use in a road fuel. The term 'petrol/ethanol blend' refers to petrol combined with an ethanol mixture. This guidance concentrates on the specific issues relevant to the UK and considers the current situation with petrol/ethanol blends with up to 5 % ethanol, E5, and also highlights areas where different issues exist with the handling of higher blend ratios up to 20 % ethanol, E20. Blends with greater than 20 % ethanol are beyond the scope of this document. This publication complements EI Model Code of Safe Practice Part 2: Design, construction and operation of petroleum distribution installations. It is intended to provide information for those involved in the storage and handling of fuel grade ethanol mixtures at petroleum distribution installations.